He was a US diplomat stationed in Marseilles, France during World War II when Germany was invading France. At great personal risk and against State Department orders, he (a Protestant Christian) used his government status to help over 2,500 Jewish people escape the Holocaust as they escaped Hitler’s occupied Europe from 1939-1941. He organized clandestine rescue efforts and escapes, harbored many refugees at his diplomatic residence and issued “visas for life” and affidavits of eligibility for passage. When the State Department learned of his actions, he was transferred to Lisbon, Portugal and later to Argentina. In the eyes of the State Department, he was an insubordinate member of the US diplomatic service, a dangerous maverick who was eventually demoted. He was not following established State Department policy – ultimately, he had to resign from the Foreign Service. Bingham refrained from speaking about his service; his family had limited information about what he had done during the war. Little was known of his extraordinary activities until after his death; then, family members found thousands of letters and official documents attesting to his quiet heroism. His son, Robert “Kim” Bingham, wrote a book about him titled, “Courageous Dissent: How Harry Bingham Defied his Government to Save Lives”. In 1998, Hiram IV was recognized as one of eleven diplomats who saved 200,000-lives from the Holocaust, which amounts to one-million descendents of survivors today. He was the only American diplomat recognized during Israel’s 50th Anniversary at the Holocaust Museum in Jerusalem. 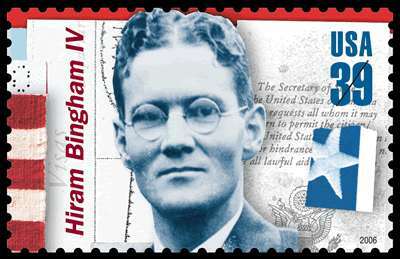 Sixty years after leaving the Foreign Service (in 2002,) the State Department posthumously recognized Bingham with the department’s American Foreign Service Association “Constructive Dissent” award. In 2005, Bingham was posthumously given a letter of commendation from Israel’s Holocaust Museum. In 2006, a US commemorative postage stamp was issued in his honor. More than 450 supporters of the Simon Wiesenthal Center gathered for the 2011 Humanitarian Award Dinner. There, the Medal of Valor was awarded posthumously to Sir Winston Churchill, Hiram Bingham IV and Pope John Paul II.